In the second story sweat pit known as the Rivera Rec Center Boxing Gym, one of Philly's best workman prospects, Gabriel Rosado prepares for his return to the ring after the fight that he thought would push his career to the next level. Rosado is not a pampered rising star. He's a fighter who has scratched himself to a misleading 14-5 pro record by taking almost any fight that has come his way. His reflex is to fight any opponent he's given, and he's done quite well so far. He's beaten a former world champ (Kassim Ouma), a seasoned veteran (Saul Roman), an undefeated hotshot (James Moore, 15-0), and a number of solid journeymen. All of these victories were upsets, surprises hinting that Rosado is more than your average Philly pug fighting in the dead end game of local boxing. He's taken a few lumps along the way, but he's shown that he's got the raw skill to get somewhere in the difficult business of boxing. He's taken the hard road, and been offered nothing for free. And Rosado has done well. But after almost five months on the shelf with the ghosts of the narrow loss in last and most important bout still rumbling around in his head, this fighter needs to fight. He needs to return to that road and struggle his way up. Take the next step forward, no matter what it takes. That's all he really knows. It's instinct. Fighters fight, and he's a fighter. His chance to finally get back in the ring will come on December 9th at Newark, NJ's Prudential Center, on the under card of Tomasz Adamek's latest foray as a heavyweight. It should be a good opportunity for Rosado. Adamek usually draws big crowds from the Polish-heavy areas that surround Newark. So Rosado's comeback will be seen by many. But for the North Philly fighter known as "King Gabriel", getting back into the ring, any ring, anywhere, is exactly what he's been waiting for. 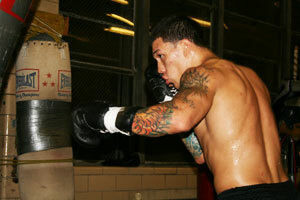 Last July, Rosado challenged fellow-Philadelphian Derek Ennis for the latter's USBA junior middleweight title. A victory promised a ticket into the top-ten of the IBF world rankings - not to mention a nice piece of hardware to strap around the winner's waist. And Rosado almost did it. The fight was a thrilling 12-round war between the two rising local stars. Rosado started strongly but Ennis gained control in the middle rounds before Gabriel stormed back for the exciting finish of the full-limit bout. After the final bell rang, Ennis had a slight edge on the cards, and left the South Philly Arena with his title belt still safely wrapped around him. It was the best night for Philly boxing in quite some time, and the bout is the clear front runner to win the Briscoe Award as 2010's Philly Fight of the Year. For Rosado and his trainer Billy Briscoe, the future rested on that fight, on winning that belt, and on getting that world ranking. Their future came down to that single night, which seemed to be the big break they had been waiting - and fighting - for. They had a good night on July 30th, but they didn't come back to North Philly as USBA champions. It was not their night. After the fight, they both tried to make sense of the situation. They spent some time beefing about the decision, but eventually turned their focus on getting back into the ring. Neither Rosado or Briscoe are ever handed anything. They have pretty much clawed their way to the brink a couple of times already. So moving on from this fight was well-trodden territory. After a disappointment, your only choices are to quit or to keep fighting. This is what Gaby and Billy do best. They return to their shabby gym and work their way back into position. They keep fighting. "The progression is the thing", said Billy Briscoe, an old-school boxing brain in an under forty year old head. "If you look at Gaby's recent fights, you can see the progression. And that's the important thing." After the Ennis fight, the plan was to get Rosado back into the ring as soon as possible. Briscoe wanted to get the taste of the loss out of Gaby's mouth and wanted to immediately begin working on the few rough spots that cost them the big fight. Briscoe initially eyed a spot on the September Teon Kennedy card in Atlantic City. But the bill was filled and had no room for Rosado. Next up was an ill-fated local card that was to feature both Rosado and Ennis in separate bouts - right back in South Philly where they had waged their memorable war. That October card ultimately fell through. Then another show, slated for December 10th at the Armory in Northeast Philly, was also cancelled. So it seemed Gaby's 2010 comeback went out the window. But then suddenly the phone rang. And for Rosado, when the phone rings, he always answers the call. Promoter Russell Peltz managed to get Rosado a spot on the big December card being promoted by Main Events. The 12-round feature bout pits two-division champ Tomasz Adamek (in his fifth bout as a heavyweight) against perennial heavyweight hurdle Vinny Maddalone. Adamek (42-1) has done extremely well in the big division, and should handle Maddalone (33-6), on his way to an imminent world title bout. A total of ten bouts (64 scheduled rounds) are slated for the Prudential Center card promoted by Main Events. Gabriel Rosado, 14-5 (8 KO) will face Jose Medina, 12-8 (5 KO), in an 8-round bout. Also, Philadelphia's budding heavyweight Bryant Jennings (4-0) takes on debuting Randy Smith in a four round preliminary. The rest of the card is a showcase for rising talent like Patrick Majewski (14-0), Sadam Ali (10-0), Tarvis Simms (25-1-1), Raymond Briggs Jr (9-0), Angel Concepcion (3-0), Jose Alejo (4-1) and Wanzell Ellison (3-0). 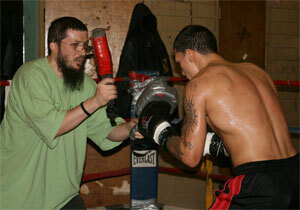 At the Rivera Rec, Rosado's preparations are going well. Briscoe puts his charge through intense routines using a truck tire, a baseball bat, as well as the more traditional tools of boxing gyms. Rosado has also gotten some sparring work with both Lajuan Simon and Bernard Hopkins, both of whom also have upcoming fights. Both men are bigger and more experienced than Rosado, and provide good hard work. 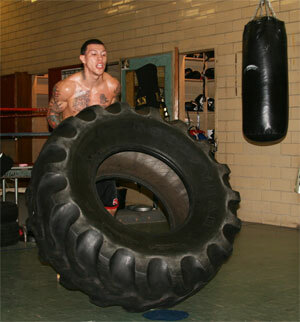 With less than two weeks to go before the Newark fight, Rosado is starting to look sharp. Looming just beyond the ropes of the boxing ring, hangs the poster for the Ennis fight. It's a reminder of how close they have come, so it serves as motivation for the future. The long and difficult road that is career of Gabriel Rosado (and Billy Briscoe) rolls through Newark, NJ on December 9th. It's another fight and another chance to get it right. These guys are throwbacks. They just keep fighting and keep working. And one day, they just might get there.